This is the first of what will be seven Appleton Estate historical rums, which I’ll post faster than usual, because they’re of a series. 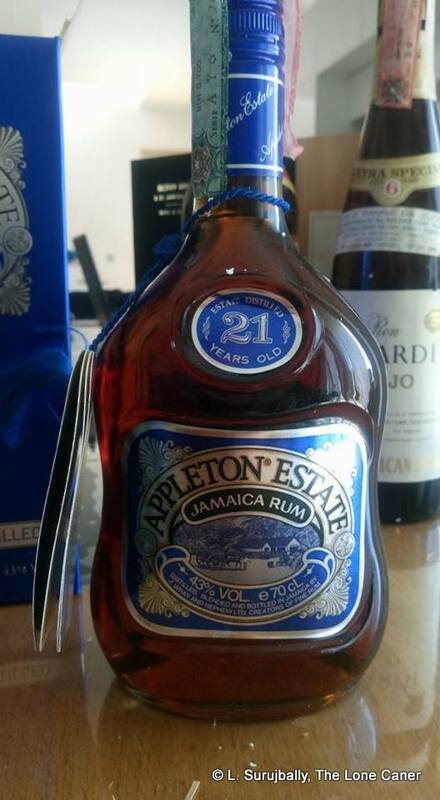 In going through them, what they all go to show is that while Appleton may be losing some ground to other, newer, more nimble upstarts (some even from Jamaica), their own reputation is well-deserved, and rooted in some very impressive rums…some of which are even extraordinary. My first pass at the Appleton 21 year old came around 2012, and I wasn’t entirely in love with it, for all its age. Rereading my review (after making my tasting notes and evaluations of its 1990s era brother here) was instructive, because bar minor variations, it was very much the same rum – not much had changed in two decades, and my score was almost the same. Nose – Frisky, a little spicy, with deep honey notes, borderline sweet. Straddles the divide between salt and sweet, presenting dates, cinnamon, citrus and slightly overripe apples just starting to turn. Becomes grapey and quite fruity after ten minutes or so into it (to its detriment), and I’m not sure the coffee and toffee background help much. Palate – A sort of sugarless, briny “rummy” flavour, heated but full, with some Jamaican funk being the only indication of its origin. Would certainly appeal to many because there’s nothing bad about it…just nothing exceptional either. As it opens up you get burnt sugar, smoke, more coffee and some vague molasses, cider (or ale), nuts; and the funk gets so laid back as to be a thought rather than reality. Decent enough, just not sure it works when faced with a full proof single barrel offering from an indie. Finish – Pretty good, longish and dry, with closing hints of bitter chocolate, hot and strong black tea, plus more toffee and salty caramel. Thoughts – Even in 2012 this was a shade too bitter (I attributed it to over-oaking, which is also an opinion I finally conceded the 30 year old had), and I guess it was a core attribute of the range from the beginning. A decent enough rum, honest enough, just not a definitive marker of its age, or its country. Other Rumaniacs have also reviewed the rum, check here for their opinions.